39. Schedule all school elections with general elections in November. By requiring that school governance and finance issues appear on the November ballot, significantly more citizens will know the place and time of the election and will exercise their right to decide how their schools will be run. Ballot consolidation would also relieve school officials of the responsibility for conducting elections and allow them instead to focus that time and money on their primary responsibility educating children. 40. Exempt innovative schools and school districts from the requirements of onerous state statutes and regulations. Public policy should encourage teachers and administrators to recognize the diversity of students and provide the array of educational programs that will better address the varied ways children learn. These alternative education programs, known as "schools within schools" and pioneered by New York City's District 4, have demonstrated significant success. If significant numbers of parents and teachers want to implement alternative programs, the state superintendent of public instruction should be authorized to exempt a school or district from state requirements that inhibit innovation and to guarantee that freedom as long as educational progress is demonstrated. Parents within the district wishing to enroll their child in a traditional school or an alternative school should be free to do so. 41. Replace Michigan's public school "count day" with an average daily membership calculation. Michigan should discontinue using a student count day to determine school population and adopt an average daily membership (ADM) method for determining the number of students attending a school on a daily basis. An ADM method would take school attendance numbers over time and calculate the average number of students attending school each day. Currently, each district's pupil count is a blend of two count days. The blend is comprised of 20 percent of the count taken on a day in February of the prior school year and 80 percent of the count on a day in September of the current school year. States that use an ADM method of accounting for student attendance ensure that schools are fairly compensated for students they actually teach. Schools with an increase in attendance receive an increase in funding. Conversely, schools with dips in attendance realize dips in funding. Schools are paid only for the days that students attend school. Not only would the ADM method of accounting for student attendance save the state money, it also would encourage attendance. Determining a school's funding amount based on average daily attendance would reward schools with consistently low truancy rates. With just two count days, schools have been known to artificially inflate their numbers by having pizza parties or using other gimmicks on count days to bring in students not in attendance on a regular basis. Additionally, students at their desks would truly represent funding for school districts, encouraging schools to treat parents and students more like valued customers. 42. Give schools "real-time" funding for their per-pupil portion of state aid. Currently, the state per-pupil grant, which is the bulk of public school district funding, is paid annually. The remaining state aid is paid in eleven equal portions on the 20th of every month, except for September. The per-pupil grant should also be in monthly installments based on the "average daily membership" count (see recommendation 41, above) for the previous month. Current law presumes that attendance will remain constant for the entire year. But a number of factors, such as immigration (immigrant workers' children) or transfers from charter, public, or private schools, affect schools' population. With "real-time" funding, schools would be able to accurately forecast the amount of money that they will receive without the delay in funding. The dollars would follow the student, and schools faced with sudden increases in students are assured a fair share of educational funding. Additionally, school districts would be forced to manage their funding on a cash flow basis based on student attendance, much like other service providers (restaurants, hospitals, etc.). 43. Exempt public schools from the Prevailing Wage Act. Earlier in this document, Michigan's Prevailing Wage Act was explained as special-interest legislation designed to benefit organized labor at the expense of anyone in the state who receives state tax dollars for a construction project. The act, in effect, requires the payment of union-scale wages and tends to lock out the majority of Michigan construction workers and firms that are open (or "merit") shops. The act should be repealed in its entirety. However, legislators who are unwilling to go the full measure should at least provide relief to the state's public schools by exempting them from compliance with the Prevailing Wage Act. Within the first five years, such an exemption could save Michigan schools millions of dollars in unnecessary construction costs-money that could be better used in the classroom. Legislators who oppose such an exemption have no right to decry a shortage of funds for public education. The Ohio Legislature in 1997 exempted schools from that state's prevailing wage law-saving schools an average of 10.5 percent in construction costs, according to the nonpartisan Ohio Legislative Budget Office. If Michigan were to follow Ohio's lead, our schools would save at least $150 million annually-a figure that represents 10 percent of average annual school construction costs and which is equivalent to $90 for every student in the state. For further information, please see www.mackinac.org/3844. 44. Strengthen the powers and responsibilities of local school boards. competitively bid for noninstructional service providers. Privatization of transportation, food service, building maintenance, and janitorial services allows for cost savings on these budget items. Privatization also allows for a reduction in the amount of oversight of these services by administrators and an increased focus on classroom instruction. These and many other suggestions for improving schools through changes in school board collective bargaining policy are explained in the Mackinac Center for Public Policy study, "Collective Bargaining: Bringing Education to the Table." For further information, see www.mackinac.org/791. 45. Encourage innovative programs to enhance accountability in education. Public school districts and private schools should shoulder at least some of the financial burden of addressing the lack of basic skills among their graduates. At least one school district has proposed some sort of "money-back guarantee" for high school diplomas. In other words, if high school graduates are unable to demonstrate mastery of basic skills, schools would have to pay for at least some of the cost of remedial education for those students. This financial responsibility would provide a further incentive to schools to ensure that their graduates were minimally competent. 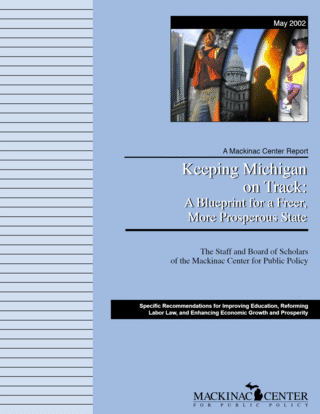 In September 2000, the Mackinac Center for Public Policy released a pioneering study entitled, "The Cost of Remedial Education: How Much Michigan Pays When Students Fail to Learn Basic Skills," by Dr. Jay P. Greene. (The study is accessible on the Internet at www.mackinac.org/3025.) It showed that the annual cost to the state's businesses and universities of the failure of Michigan students to acquire basic skills in high schools is $601 million per year. One of the study's recommendations was for schools to provide a "money-back guarantee." As it turns out, there is at least one public school district in Michigan that has been doing that successfully for several years: Rockford Public Schools, near Grand Rapids. It's a model that ought to be encouraged all across the state. For more information, read a commentary by the Rockford Public Schools Superintendent Mike Shibler on the Internet at www.mackinac.org/3179. 46. Enact "Freedom School" legislation. As first proposed in 1993 by Mackinac Center Senior Policy Analyst Dr. Gary Wolfram, the "Freedom Schools" plan would introduce reforms to the public school system that would help all children receive a quality education. Here is how the plan would work. A supermajority of the parents of a school, perhaps two-thirds, or a supermajority of the teachers in a school, perhaps three-fourths, would have the ability to declare the school a "Freedom School." This would set the school free from the current system and free from the school district. The per-pupil school operating funds would then go directly to the school rather than to the district headquarters. The school would be able to operate independently of the district, setting its own curriculum, uniform policy, personnel policy, etc. However, no child would be assigned to the school (it would truly be a "choice" school), and thus the school would have to provide an education that is better than the alternatives in order to retain and/or attract students. The parents would elect a board to operate as the governing body of the school. This would not require parents to run the day-to-day operations of the school. There are several good management firms that operate public schools in Michigan. To argue that parents are not capable of electing a board or running for the board of a Freedom School is a red herring. According to Dr. Wolfram, in 1920 one in 15 adults in Michigan was on a local school board, and it's widely acknowledged that they delivered high-quality education-in some respects, much higher than we do today. The building would remain the property of the school district. However, the district would be required to rent the building at fair-market value to the Freedom School. There are methods to set a fair-market value, such as an appraisal of an assessor agreed to by both parties. Maintenance of the building would be determined in the rental agreement. Some have argued that poorly performing schools lack parental support, and thus Freedom Schools would not arise in Michigan's poorest performing districts. This theory could be tested by allowing Freedom Schools in the poorest performing districts. One reason parental participation is low in districts such as Detroit is the enormous size of the district and the inability of parents to truly affect outcomes. Freedom Schools would provide this opportunity, and the skeptics would be astonished at the interest of parents in their children's education once the parents are given greater control. The state universities of Michigan, like many of their counterparts across the nation, are suffering from a general erosion of academic standards and a politicization of the undergraduate curriculum. The traditional core curriculum that once guaranteed that all graduating students shared in the same body of knowledge and enjoyed the same competence in cognitive skills is in tatters. An in-depth analysis of the undergraduate curriculum and recommendations for reform are discussed in the Mackinac Center for Public Policy report, "Declining Standards at Michigan Public Universities." As proposed in that 1997 report, tenure rules on Michigan's campuses should be changed to encourage teaching excellence. Alternative accreditation of English departments, writing programs, and other humanities departments and programs should be instituted. Teachers-in-training should take far fewer courses in the education departments and schools of education and far more substantial courses in subject areas. The rules and regulations against political indoctrination in the classroom should be vigilantly observed and rigorously enforced. An all-campus undergraduate core curriculum should be established so that all students in state universities will undergo the essential core training and gain exposure to common, high-level material in the arts and sciences. To preserve the autonomy of the state's universities, the Mackinac Center recommends that the Legislature not attempt to meddle directly by legislation in the curricular and personnel affairs of those universities. To advance a serious, statewide discussion of these and other reforms recommended in the report, the Mackinac Center calls on the governor to appoint a special commission for the purpose of reviewing those recommendations and examining university issues such as curriculum and tenure. For further information, please see www.mackinac.org/236.